This beautiful, clean and minimal free charity WordPress theme is easy to manage and can get you started with a fully functional website in just a few minutes. It is made for charitable trusts, non-profit organizations, NGOs, amnesty organizations and disaster relief force. Its code is written to design a website for fundraising events, donation camps, political campaigns, rallies and other similar events. Websites which do not load fast tend to loose visitors easily and this is unforgettably kept in mind by the developers to keep your website away from any bloat enhancing its speed. Its well-organized sections and thoughtfully designed menu ensures smooth navigation. Properly placed call to action buttons will lead visitors to your area of interest. The free charity WordPress theme is built on Bootstrap framework which not just makes its layout fluid producing a responsive website but also facilitates its usage. This free charity WordPress theme loads effortlessly on different browsers. It can be translated to various languages thanks to the .po and .mo files bundled with it. It follows standard design pattern for good SEO. Social media icons can be a big aid as they can connect you with maximum people. It can be customized to change its logo and upload your own and do slider settings. 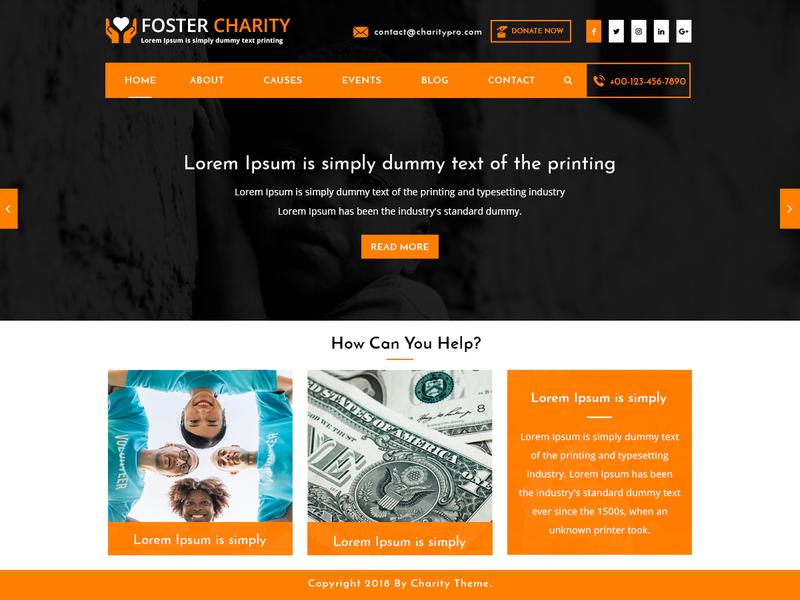 This free charity theme is vastly documented to help you install, configure and do small changes to the website on your own. It is readily compatible with third party plugins including WooCommerce plugin.